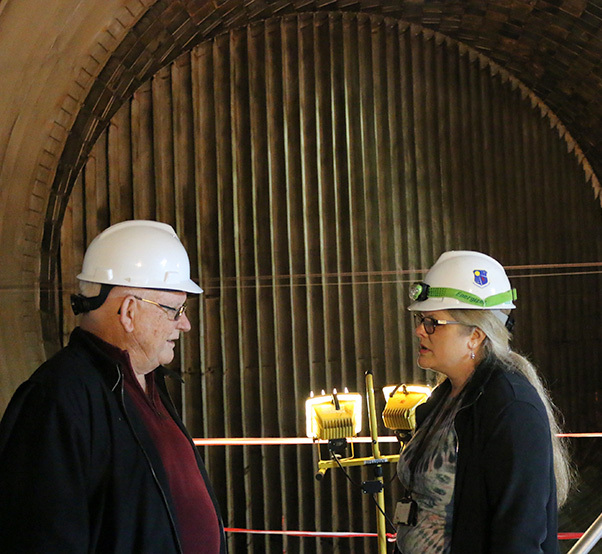 With the wind tunnel itself serving as the backdrop, AEDC retiree Bill Comer, left, discusses the early days of Propulsion Wind Tunnel 16S with engineer Valerie Davenport, a member of the core engineering team assigned to the 16S Return to Service project. Comer was one of eight retirees who recently visited Arnold Air Force Base to offer their input and knowledge as current employees work to return to 16S to service. After the initial construction of the Propulsion Wind Tunnel facility at Arnold Air Force Base, it was one thing for the engineers and project managers charged with bringing the 16-foot Supersonic (16S) wind tunnel online to have the facility design parameters. Forcing the air to accelerate to four times the speed of sound was another thing altogether. By the early 1960s, they had figured it out, and the notes and knowledge amassed by those who brought 16S to fruition are once again being put to use. 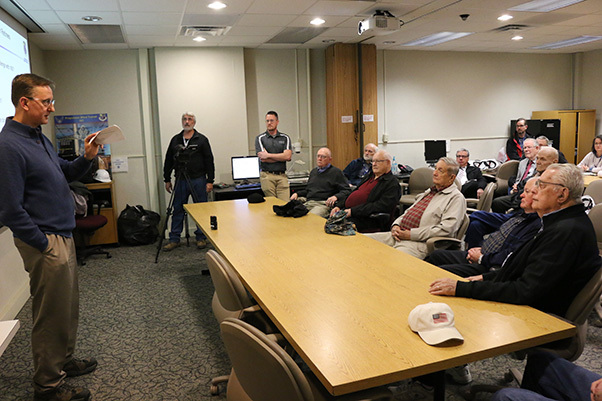 A group of eight retirees who either helped bring 16S online or worked within the facility during its infancy returned to Arnold AFB April 6 to offer their advice and expertise to current employees who are working to return the wind tunnel to service. The retirees toured their old stomping grounds, including the 16S massive flexible nozzle and the facility’s former control room. They had the opportunity to once again visit with the “Iron Horse,” the mounting device for the tunnel calibration rake once used within the PWT supersonic circuit. 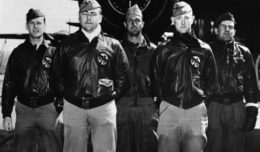 All the while, the men shared their memories and advice with current employees, detailing the challenges they faced and successes they realized in the early days of 16S. 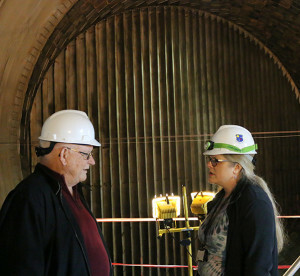 “I really think there’s information, there’s knowledge, in their heads that we’ve lost because we haven’t run this tunnel in 18 years,” said Greg Sandlin, 16S Return to Service contract engineer and organizer of the retirees’ visit. The retirees who attended the event were Spurlin, Milt Davis, Warren White, William Comer, Bob Cornelius, Jim Patterson, Jimmy Chasteen, and recent retiree Keith Osborne. Comer began his career at AEDC in 1958, and 16S was the first tunnel in which he worked. He said the best part of the visit was reconnecting with co-workers and speaking with those who are now working to modernize what he and others started. “It was really good, especially having the opportunity to talk with the people who are doing the work now that we did years ago, and just to see the equipment that I haven’t seen in quite a few years and see what’s going on,” Comer said. Spurlin, who began his AEDC career in 1958 as a co-op student before joining the PWT team in 1971, said what stood out was the fact that instrumentation and equipment found within 16S designed and fabricated decades ago is still functional and capable of modernization. “It’s obvious that it’s going to take a significant investment to bring this thing back, but the return on the investment, I don’t think you can calculate that,” Spurlin said. The supersonic wind tunnel 16S made its first run in 1960. In 1989, the American Society of Mechanical Engineers designated the PWT complex an International Historical Mechanical Engineering Landmark. As national priorities shifted, usage of the 16S facility declined and it was mothballed in the 1990s. Comer said it was “disheartening” to see 16S become little more than a stop on Arnold AFB tours. “I’m excited to realize that it’s going to become operational again,” he said. After years of inactivity, the nation’s needs once again required the capabilities of the facility. In 2013, an assessment of the condition of 16S driven by the knowledge of the future needs of supersonic and hypersonic systems was conducted. “The assessment concluded with a successful air-on operation in 2015 which provided the Air Force with confidence to invest in returning 16S back to an operational state,” said Flight Systems CTF Technical Advisor and previous 16S assessment team lead Scott Meredith. According to Paul Wright, Air Force project manager for the return to service project, the goal is for 16S to again become operational by January 2019 and to have the facility ready for a test customer at that time. “We have test customers that would be in the door now if it were operational,” Wright said. The return to service project will involve the refurbishment of the current 16S systems, putting them back in operation. Those involved with the project will stage additional work in between test customer work. Along with improved reliability, the long-term strategic vision for 16S includes the addition of capabilities never before seen within the facility. Wright said efforts will be made to improve flow quality and add store separation testing through the modification of the Captive Trajectory Support system. He also said there are plans to extend the tunnel’s Mach number out to 6, an increase over the Mach 4.75 it previously supported. “We understand it was originally designed to go out to Mach 6 and perhaps even beyond, and we just haven’t had that capability due to hardware limitations and other things,” Wright said. 16S Return to Service Contract Engineer Greg Sandlin, left, welcomes the group of AEDC retirees during their ecent visit while Air Force Project Manager Paul Wright (standing, third from left) looks on. The retirees, who all worked at the 16-foot Supersonic (16S) wind tunnel during the early years of the tunnel, were invited to Arnold Air Force Base to offer advice to the team currently working to return 16S to service. Wright said the strategic plan also includes live engine testing, a capability once present at 16S but one that has not been utilized for some time. Flight Systems Combined Test Force Director Lt. Col. David Hoffman reiterated that 16S already has “years” of customers lined up, with thousands of hours of testing time committed over the next few years. Hoffman also said 16S is a necessary asset for both Arnold AFB and for the nation’s defense. Sandlin was inspired to coordinate the retirees’ visit after recently running into Comer at a local restaurant. After Comer sent Sandlin a photograph from 1960 of nine men – three of whom were present for the recent retiree visit – posing with the Iron Horse, Sandlin thought there would be no better group to offer advice to the return to service team than those who first got 16S up and running. “There are very few current employees with any 16S expertise, so this was about picking their brains, asking how they did it, the mistakes they made, how do we avoid the potholes,” Sandlin said. Sandlin added the event was also about building relationships between the retirees and current employees. William Layne, an electrical engineer who is part of the core engineering team assigned to the 16S return to service project, said one of his main takeaways from the visit was that the retirees relayed similar concerns to running the tunnel decades ago that the current team is now expressing, adding that issues those who first worked on 16S faced are still a problem despite advances in technology and automation. Along with his stories and technical knowledge, Spurlin shared a key piece of advice, urging those who will work in the restored 16S to focus on the priority that will determine its success. “Understand what your customer wants, because if you didn’t have the customer we wouldn’t be here,” he said.